Light reveals the beauty of the world to us. The light of New Mexico is extremely special. The colors are vibrant and the wide-open skies project a luminosity that transforms the textured and curving architecture and landscape into a visually magical and wondrous place. This workshop is being offered to all photographers who are excited to find new inspiration and experience the fun of a different culture and cuisine within our borders as well as painters who use photography to capture their images to paint. Check out why artists like Ansel Adams and Georgia O’Keeffe were drawn here. The workshop will help you discover and fine-tune your reactions to light, your own personal vision and creative process. It is important for all artists to understand in practical terms how the behavior of light defines the nuances of form, color, texture, space and atmosphere. There is a structured schedule with a balance of teaching, shooting, critiques and discussions of work created during the workshop. There will be time for careful study of the relationship between environment, light, architecture, and people, especially time for recognizing those elements, which may effectively lead to photographs or paintings of insight and emotional value, while always being aware of the effect that light plays in capturing the illusion of value, form, color and space. 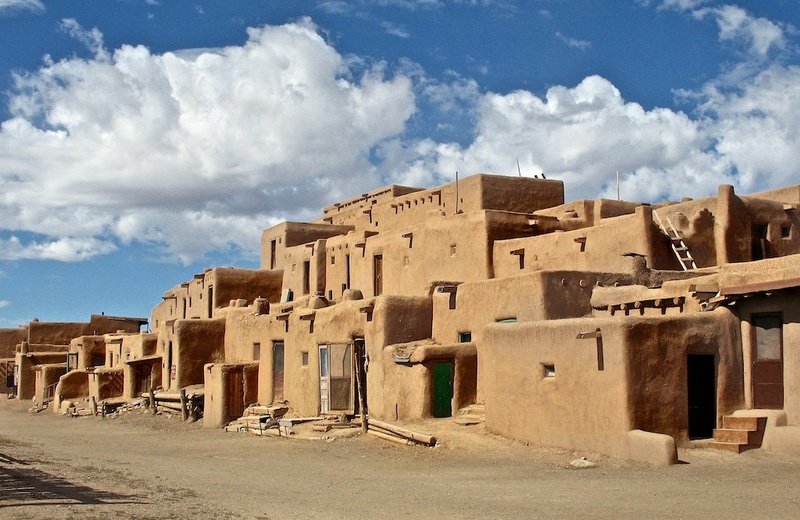 Formal and informal architecture will be found in the small towns of Abiquiu, Cerrillos, Chimayo, Trampas and Truchas as well as the large cities of Santa Fe and Taos. While in Chimayo, we will visit the Santuario de Chimayo, one of the most popular churches in New Mexico, famous for its miraculous healing mud, and the numerous small shops filled with fine traditional Chimayo weavings. On day trips to the Abiquiu area, we’ll explore some special sites along the Chama River with a visit to Ghost Ranch where Georgia O’Keeffe explored the landscape of the high desert to paint the multicolored cliffs, clear blue sky and cottonwoods at the height of their color. Some time will be spent in the city of Santa Fe, a city that is one of America’s great art, fashion and culinary capitals. On Canyon Road you will find Spanish colonial, Spanish/Pueblo and American territorial architecture, which has been burnished and mellowed by the passage of the years. You will discover more than five dozen galleries with paintings, sculpture, Native American crafts, traditional Spanish crafts, Santa Fe fashion, photography and antiques literally spilling out of the doors. You can find world class food or a quiet bar with a warm fireplace on a cool fall afternoon. Stop in at the Georgia O’Keeffe Museum and view the largest collection of original O’Keeffe works in the world. We will spend another day discovering the delights of the Taos area. Taos is actually a blend of several close-knit communities that, together, provide a world of infinitely varied experiences. We will visit the famous Ranchos de Taos Church and the ancient living Indian village of Taos Pueblo that has stood unchanged for centuries. Experienced painters are also invited to join in the fun. Although there will be no formal instruction in painting, Ori enjoys the cross pollination that takes place during many of her workshops between painters and photographers. Both have much to learn from each other. Painters will be encouraged to sketch and photograph the compositions and colors so that they can express their vision when they return home. There will be plenty of time at each location for painters to complete sketches, small sized works or vignettes. Do not expect to do any studio-quality work that is large in size and scope. Instead, take full advantage of your reason for leaving home in the first place: to see many wonderful landscapes that are new to you and open all your senses to the experience. Photographers may be at any level. Digital shooters will have an opportunity to share their images in the evening during a series of one-on-one sessions with Ori. Having your own laptop to work with would be great but not necessary. Nancy J. Ori is respected internationally as an industrial photographer, video producer and fine art exhibitor. She has been affiliated for many years with the Ansel Adams Workshop in California and studied with Adams in 1978 and 1980. She is on the faculty of numerous museums and art centers in New Jersey and runs a workshop series annually that now extends to European destinations, Cuba and throughout the US. In 1990, she began the New Jersey Heritage Workshop Series in Cape May for photographers and other artists and in 1995 founded the NJ Photography Forum for serious photographers interested in exhibiting their work. Her current interests lie in transforming her landscape and floral photographs with pastels, encaustic wax and colored pencils. She will be accompanied by at least one assistant from her group. Her group, called the Wizards, is an ongoing workshop of five mature photographers working on common goals and supporting each others objectives. At least one Wizard will be joining this workshop to assist and share their expertise. Participants are responsible for their own air and ground transportation, meals and lodging. Transportation during the workshop will be by a private rented van in order to keep the group together. The cost will be $125 each. Somestudents may elect to rent their own cars but will be required to follow the van to each destination. We will be staying at the El Rey Inn in Santa Fe. Our lodgings are as unique as New Mexico itself with locally woven rugs, fountains, flowers, adobe structures, fireplaces, hot tub and private outside seating areas. Breakfast is included. Singles, doubles and suites are available. Call: www.elreyinnsantafe.com and book your room early. This is balloon season so they fill up fast. Lunch and dinner will be at your expense and in most cases will happen while we are all together on location. A list of restaurants and maps will be distributed each night for the next day’s working sessions in relation to our locations. Except for the very small villages, there are generally a number of restaurants to choose from with varying menus and price ranges. You are encouraged to bring a significant other to share this rewarding experience overflowing with history, culture, beauty, warmth and lots of shopping. Guests are certain to have an equally wonderful time and are welcome as an integral part of the workshop to join us each day on our tour and to all meals and activities. Cost: $850 each, plus van fee of $125. Price includes: Pre-trip brunch and orientation session in NJ, post trip reunion and critique session in NJ, tuition during the workshop, evening one-on-one sessions, and wine and cheese reception. Not included: lodging, food, rental car and air travel. More information on lodging and itinerary will be sent upon receipt of your registration. Payment in full is required to hold your spot.